There were difficulties from the first day the blustering and objectionable Major Stirrop set foot in the Prisoner-of-War camp. Captain Ludovic Travers, his adjutant, saw trouble—dire trouble—looming ever nearer. For there was something sinister about the camp, and there were strange happenings among the prisoners. One day, when Travers was making his count, there was one prisoner too many; the next the numbers tallied rightly—only to be wrong again within an hour or two. An escape plan is uncovered, and then Major Stirrop was murdered. And not only the Major—for another strange death is later brought to light. Travers will join forces once more with his old friend Superintendent George Wharton to get to the bottom of this mystery, one of Christopher Bush’s most intriguing and thrilling. 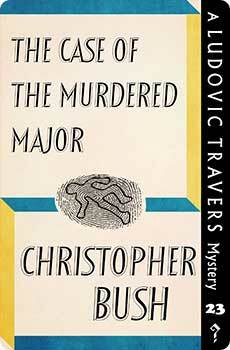 The Case of the Murdered Major was originally published in 1941. This new edition features an introduction by crime fiction historian Curtis Evans.